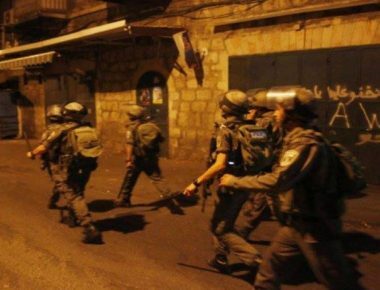 Israeli soldiers invaded, on Wednesday at dawn, several homes in Beit Ummar town, north of the southern West Bank city of Hebron, searched and ransacked them causing excessive damage, and abducted six Palestinians, including a child. Mohammad Awad, an activist with the Popular Committee in Beit Ummar, said the soldiers abducted Mohammad Monir Ekhlayyel, 37, Ahmad Khader Abu Mariya, 50, Maher Ibrahim Sabarna, 35, Waheed Abu Mariya, 14, Ayman Ali Abu ‘Arqoub, 32, and Omar Rajoub. Awad added that the soldiers also detained him while he was trying to document their invasions and violent searches, and confiscated his camera. The soldiers also summoned a former political prisoner, identified as Ala Mousa Za’aqeeq, 25, fir interrogation in Etzion military base and security center, north of Hebron. Awad stated that the soldiers stormed many homes, and violently searched them, in the downtown area, Khallet al-‘Ein, ‘Aseeda, ‘Erq a-Latoun and Safa. Owners of some of the invaded homes have been identified as Mohammad Shafiq Ekhlayyel, Monir Ekhlayyel and Waheed Abu Mariya; the soldiers smashed their doors, and violently searched them, also using military dogs. Also at dawn, the soldiers invaded Silwad town, east of the central West Bank city of Ramallah, violently searched and ransacked homes, and abducted a former political prisoner. Furthermore, the soldiers abducted two Palestinians in the West Bank districts of Tubas and Tulkarem, during violent invasions and searches of homes, and invaded the al-Khader town, south of Bethlehem, before shutting down a carwash facility.